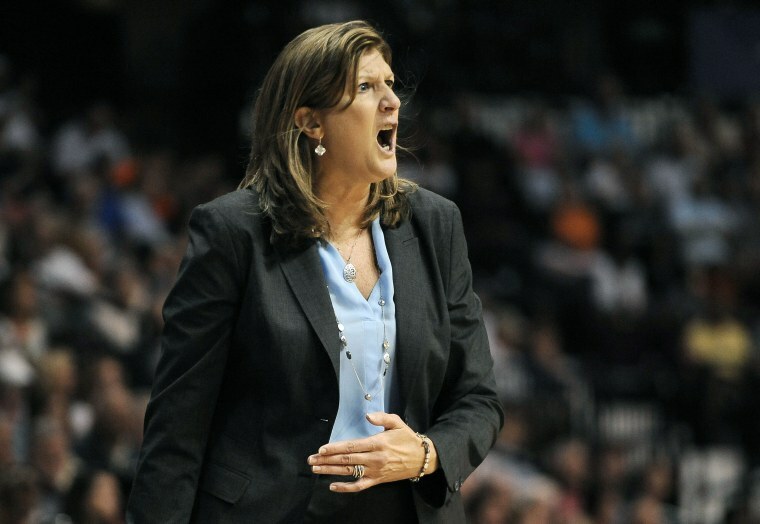 The dominating center was the youngest coach and the first female coach to win the WNBA title. Anne Donovan, the basketball Hall of Famer who won a national championship at Old Dominion University, two Olympic gold medals as a player and another as a coach, died Wednesday of heart failure. She was 56. Donovan, a 6-foot-8 center, coached in college and the WNBA. She became the first female coach and the youngest person (42) to win a title in the WNBA, guiding the Seattle Storm to a championship in 2004. Donovan was a member of three Olympics teams as a player. The 1980 team didn't go to Russia because of a boycott. The team won the gold in 1984 and 1988, and she coached the winning 2008 team. Donovan also coached the WNBA's Indiana Fever, the Charlotte Sting, the New York Liberty and the Connecticut Sun, with whom she worked from 2013 to 2015. A New Jersey native, she also coached at Seton Hall University for a few years. "It hurt bad. To be totally honest, she was the only coach I ever played for that challenged me and forced me to be better," said Tina Charles, who played for Donovan on the Connecticut Sun. "At a young age I didn't understand it. For me it [stinks] because I always wanted to text her, thank you for being hard on me. Thank you for saying to me before practice you're not taking a hook shot this practice, get to the basket, figure it out. It's sad." Liberty coach Katie Smith, who played for Donovan with USA Basketball, was emotional in her postgame news conference, saying: "It's tough. It's tough." Smith saw Donovan at the Women's Basketball Hall of Fame, where Smith was inducted as part of this year's class. Donovan's high school coach, Rose Marie Battaglia, was also part of that class. Val Ackerman, who was the WNBA's first president, said Wednesday: "Anne was a giant in every sense of the word, and I know the women's basketball community is saddened beyond words by this tragic news. She was a pioneer and icon in the women's game and made a profound and lasting impact at all levels as a player, coach, colleague and friend."